Traveling to Canberra for Easter. Contact me for collection at EPIC. This is currently out of stock. 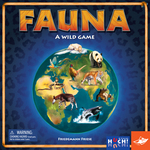 360 animals on big cards are waiting for the players of Fauna. Every round a single animal presents itself by name and picture. The 2-6 players try to guess the animal's weight, length, height, tail length and - most important - the areas in which the animal lives on the Earth. The early bird gets the worm: an area on the big map or a sector on the scales already occupied by a player token cannot be chosen a second time. When no player wants to set another token the round ends and the scoring is performed. Tokens on correct spaces get points for the corresponding player, also tokens in the direct neighborhood of correct spaces score points. Tokens not earning points are temporarily out of the game - so risk should be carefully considered. Next round - next animal - starting player changes. The first player who reaches a certain total score wins (normally after 8-12 animals).